Changing my career from a full time non-profit accountant and software trainer to a therapeutic musician eight years ago has been a huge positive influence on my good health and well-being. I enjoyed studying to become a Certified Clinical Musician and keep up with the latest research on music not only for patients but also for the therapeutic musician. A recent collaborative research study on highly empathic people and music found evidence supporting a neural account of the music-empathy connection. Also, it is among the first to use functional magnetic resonance imaging (fMRI) to explore how empathy affects the way we perceive music. "Those who deeply grasp the pain or joy of other people and display “higher empathic concern” process music differently in their brains, according to a new study by researchers at Southern Methodist University and UCLA. Their paper, “Neurophysiological Effects of Trait Empathy in Music Listening,” was recently published in the journal Frontiers in Behavioral Neuroscience." When I provide therapeutic harp music in facilities, it is typical that I do not have information on the patient or resident other than name and age. Last week I was thrilled to provide the joy of music to a Centeraian, 100.5 years old! She had two daughters with her, chatting, trying to keep her spirits up. When I showed up with the small harp and ukulele, I knew right away only the harp would work as she had only one hand she could use. She sat up a little straighter, raised her hand to meet the strings on the harp that laid on the table before her and stroked it as her eyes started to sparkle and smile. Her daughters told me that music was very important to her in her life, that she played the piano before and how this little harp seemed to make all the difference to her in that moment. 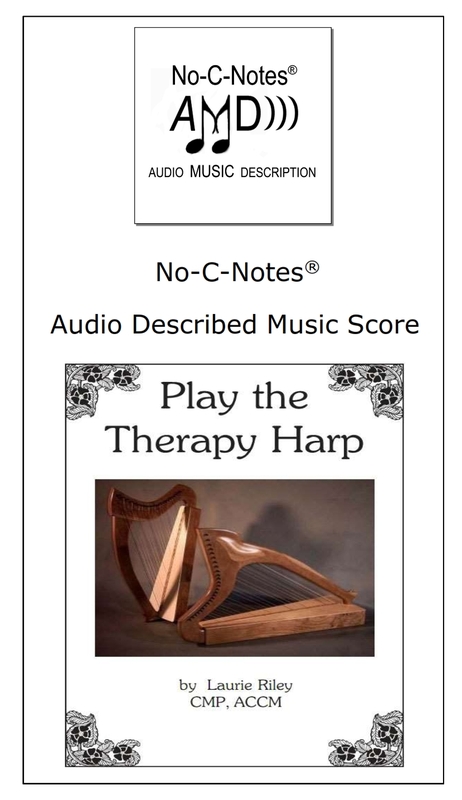 In addition to providing therapeutic harp music and instruction to those with challenges, I have been publishing No-C-Notes audio music described score for 30 years now. Most of the music I have transcribed from print into audio has been per request from a musician, student or teacher which has been copyrighted. That means I could not resell it to anyone other than the requester. I have such a large library of transcribed works, but major publishers have yet to give me permission to resell it. Obtaining permission is my 2018 goal! 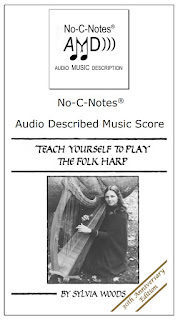 I have coached many new harpers with learning how to play a lever harp and they have asked if they could have Teach Yourself to Play the Folk Harp by Sylvia Woods in No-C-Notes audio. She graciously said Yes! and the project is now complete. 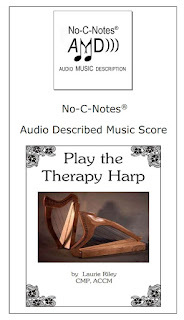 This book and Laurie Riley's Play the Therapy Harp in No-C-Notes have excellent instruction and music exercises and songs for beginners through intermediate players. 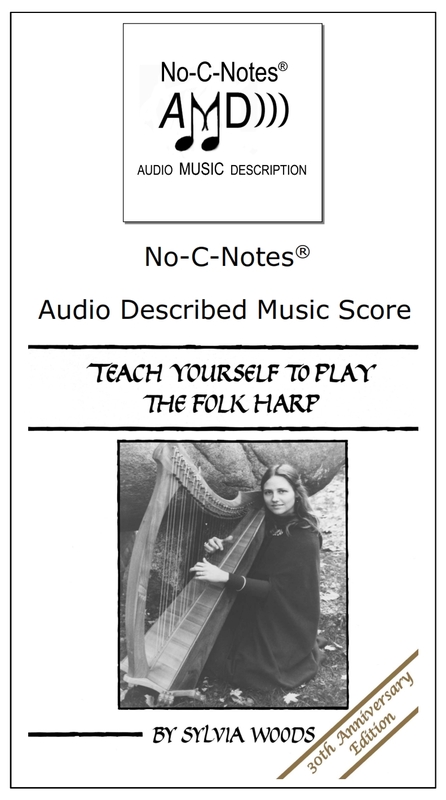 I am excited with Teach Yourself to Play the Folk Harp now available in No-C-Notes version. I have been slowly finishing up some public domain, mostly Celtic, harp music to offer so keep checking the catalog pages. My future blog postings will be keeping you up-to-date with new audio score availability, response to questions and requests and interviews with harpers with disabilities and teachers. Student and her para adpating the harp position to play. Christina with the Harp building class. The week of January 28 I was fortunate to be the teaching artist in residence at the Minnesota State School for the Blind through the generous support of VSA Minnesota and the Minnesota State School for the Blind Foundation. I provided three classes a day involving group and individual harp instruction and harp building. The final day held a performance and presentation playing their Name Song on the harp, playing Ode to Joy ensemble and presentation on how they built a harp. I also provided therapeutic music for students who were not in the study groups. The school had purchased their own accessible harps and they have been included in their daily music program. Many of the students had multiple challenges along with their visual impairment or blindness. Students in my groups ranged from Autism, ADHD, ADD, Learning Disabilities, Deaf and Hard of Hearing, Ushers Syndrome, CHARGE Syndrome, Emotional/behaviors Disorder, Cognitive and Development disorders and Cerebral Palsy-just to name a few. I had a wonderful time with the students, teachers and staff at MSAB and appreciate the opportunity to share Harp-Abilities with them. I play my therapy lap harp and double strung harp weekly at a regional rehabilitation center. I always start with playing for the patients who typically are under the closest supervision and have the lowest mobility. Then I move on to all the other patients on the floor, offering individually to them bedside harp music for relaxation and distraction. I finish by playing harp in the common gathering area for those who missed me before, or want music in a setting that is not bedside and typically family will be there also. There was a patient who was motionless, sitting in the wheelchair that was pulled up to a dining table and his adult son was with him, questioning, comforting, trying to communicate with his uncommunicative and still parent whose head was down and eyes closed. I started playing just a light feathering of notes on the harp and settling into an improvisation of a not-familiar Celtic tune. Frankly, I don't think anyone knows the words to this tune and most Celtic ones, but the rocking motion of tune and resonance of the harp can soothe. I hadn't played more than five minutes when the son rushed up to me with tears in his eyes and said "He's singing, Dad is singing! He's in there somewhere and happy now". And so he was, singing to a song without words, but within him was a song and a story that only music could bring out of his depths. Not only was the patient advancing in his healing, but so was his loved one. Harp-Abilities is back from Facebook postings and calendar to Harp-Abilities Blog. The format and accessibility is much better. I will transition my Facebook postings to this Blog spot and will include an Event Calendar. Thanks for following! Emily was one of my students at the 2005 Summer Institute for College Bound Blind Musicians. She loved trying the small harps I brought and learned No-C-Notes audio music description to help her with music reading. She was full of life and her memory will live on. Harp-Abilities bring the joy of harp for those with challenges. Accessible and inspiring for expression, communication and relaxation. Harp-Abilities began with No-C-Notes audio music reading for the blind to touch the harp and be touched by it. It has expanded to Health care organizations, nursing and assisted living homes, schools and community service programs. Celtic harp music for those with various challenging physical abilities now discover their Harp-Abilities.